Cleaning hacks for dog moms are a must to save time and keep your home clean and smelling fresh. Dogs are part of the family but they can be super messy and smelly. I constantly find socks, dog toys, and dog hair all over my home! As much as I love Chuy, I don’t love the mess that comes with being a dog mom! 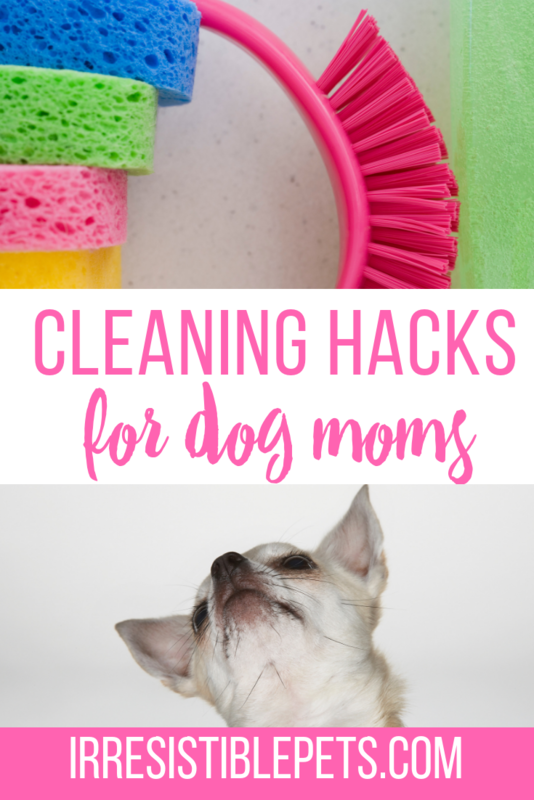 I’ve put together a list of cleaning hacks for dog moms that you’ll want to pin and save. Every dog mom needs a good lint roller for dog hair. The hack is that you can use your lint roller on more than just clothes. You can also use it on your sofa, pillows, furniture, and even in the car! I keep one lint roller in the house and a mini lint roller like this in my purse for when Chuy and I are on the go. 2. Fur on the Couch? Get This Cleaning Hack! If you have dogs, I recommend leather sofas that you can easily wipe down. Plus, they don’t collect hair like fabric upholstered couches do. Not everyone can just run right out and purchase a new couch so here’s a hack you need to know. All you need is a pair of rubber gloves! Simply dampen the gloves and rub your hands over the couch. The damp glove will lift the fur right off the couch. Just rinse and repeat. Literally! Dog odors really linger inside of your dog’s bed, blankets, and even on your pillows and throw blankets. To keep the dog odor to a minimum, plan on washing all of your dog’s linens at least once a week. If they use a metal crate, make sure to wash ans scrub that too. I also recommend having a stain and odor spray for sanitizing and cleaning in a pinch! Dog hair loves to accumulate on the baseboards. The easiest way to clean them in a pinch is to use baby wipes or Clorox wipes. I personally prefer the Clorox wipes because they get the hair off and disinfect everything. This might seem too simple to be a hack. You’d be surprised how many people don’t regularly groom and clean their dog. Regular brushing does a couple of different tings. One, brushing takes away the coat of fur that’s already loose and going to shed all over your house. Two, getting rid of this fur before it falls out gets the dog smell out. Plus, your dog will love all the special attention. I absolutely love and recommend the Furminator for brushing your dog. I don’t like wasting time shopping at the store for the necessities we need. I put things like dog food, cleaning supplies, dog pads, and paper goods on a monthly subscription with Amazon Subscribe & Save. This is a huge time saver and you save a bunch of money when you subscribe for regular orders for all your cleaning and pet supplies. I love me some cute doggie paws but they can track in lots of dirt. Put door mats at each door entry that your dog uses. I have a huge one leading out to our backyard that says “Wipe Your Paws” and it’s so cute. But, it also serves a double purpose b/c it helps to remove dirt from Chuy’s feet. Another hack is to wipe your dog’s paws with baby wipes or dog grooming wipes if they are super dirty. My personal favorite are these Multipurpose Grooming Wipes from Burt’s Bees. I’m all about saving time. Did you know that you can wash plastic dog toys in the dishwasher? Make sure to put them on the top rack and don’t use the heat drying setting. For the stuffed/soft toys, pop them into a garment bag and throw them in the washer machine. Don’t mix dog toys with your regular dishes and clothes! We have a mat in the kitchen where Chuy’s food and water bowls go. That way, when he slobbers water or spills his food, it’s all in one place and I don’t have to constantly scrub the floor. You can just throw the mat in the wash and be done with it. This silicon dog food mat is convenient because you can wipe it down or even throw it into the dishwasher. Open the windows a few days a week to air out your home. Get an air purifier to help with the dander and smell in the air. My personal favorite is the Febreeze Air Purfier. Use an air diffuser with essential oils. After reading this post, you should have some new cleaning hacks for dog moms. Do you have any cleaning hacks that we didn’t list? Let us know in the comments. Follow us on Facebook and Instagram to stay up to date with our next adventure! Check out our Pinterest for more dog treat recipes. « Are Apples Good for Dogs?